Amy Smith is a contemporary abstract artist who is inspired to create expressionist paintings that capture feeling and emotion. Amy works in mixed media and acrylics to create abstract fine art that is deeply layered and textured. Her contemporary art is a form of storytelling. She captures these stories with color and gesture and mark making. Subscribe to our mailing list and receive access to a free tutorial video. Much of Amy’s work is considered Abstract Expressionism. Expressionism is a style of fine art that allows the artist freedom to express emotion and experience through non-representational and non-traditional means. The original abstract expressionist artists of the 1940’s- 1960’s included famous women artists such as Helen Frankenthaler, Joan Mitchell, Lee Krasner and Elaine DeKooning. Amy names these female pioneers as influencers on her style of contemporary abstract expressionist art. Mixed media artwork incorporates more than one type of art medium. Amy uses acrylic paints along with collage elements, and charcoal and graphite for mark making. The resulting mixed media paintings are multi layered and richly textured. Her collage elements are fragments of papers that she has painted by hand and also vintage papers and book pages. The mark making gives the mixed media abstract art movement and are representative of dialogues. In the layering some of the bottom most layers peek through and invite viewers to look deeper. Amy also enjoys a more representational approach in some of her work. She is known for her abstract paintings of flowers and trees and other facets of nature. She enjoys approaching these subjects with the same intuitive painting technique that she employs in her expressionist abstract style work. Amy loves to share her passion for art and creativity through her painting classes, individual art instruction and creativity coaching. She is passionate about helping people awaken their creativity and find their creative voice. Her art instruction teaches painting technique and design with an emphasis on being able to paint freely by following instinct and intuition. Learning to let go of control in art is a good tool for artists who work in any medium or style. She’s an art teacher who teaches painting classes in intuitive abstract painting and representational abstract painting at her home studio in Vass, NC at ARTworks Vass. She also travels with her art workshops and art lessons to events and art studios around the United States. Amy is available for individual art classes for adults and creativity coaching from a biblical perspective on a limited basis. “I Took Amy Smiths Intuitive Abstracts Class and it was an eye opener!!! Amy has been creative for as long as she can remember. She kept a stack of typing paper and pack of magic markers on the very top shelf of her childhood bedroom closet, where she would climb up and draw for hours. In her teen years Amy was surrounded by art and craft as her mom was an arts and crafts show director and later owned an art gallery on the Downtown Mall in Charlottesville, Virginia. Amy has no formal art education and is primarily self-taught. She has been pursuing her art for over twenty years. She originally worked in hot glass, making lampworked glass beads, before beginning to work in mixed media. Amy currently resides in the pine forest of the Sandhills region of North Carolina with her husband, Matt, two wonderful teenagers, four cats and one three-legged Plott Hound. 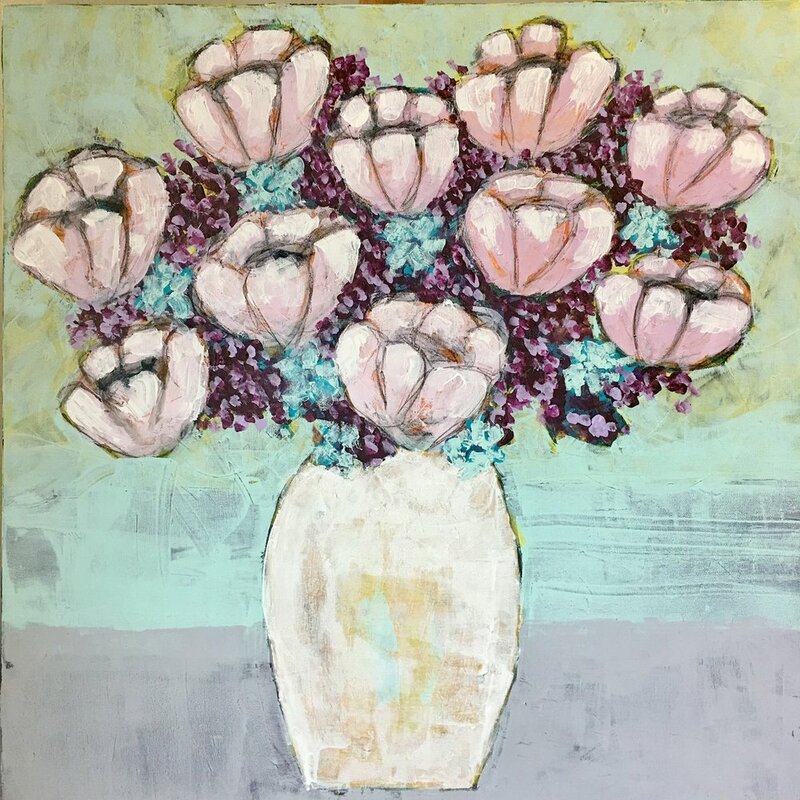 Her studio is located inside ARTworks Vass gallery in Vass, North Carolina at 129 Main St. You can find her artwork for sale there in the gallery, and at Swank Coffee in downtown Southern Pines, NC. Some of her original abstract paintings for sale may be found here on her website as well. If you are interested in bringing Amy to your location for Art classes or in working with her individually for art instruction or creativity coaching, you may contact her at Amy@amysmithart.com.